A gun isn’t a weapon; it’s a tool. Like a harpoon, or a hammer or a … an alligator. Our house came with a side stoop that was rather utilitarian, but did the job. 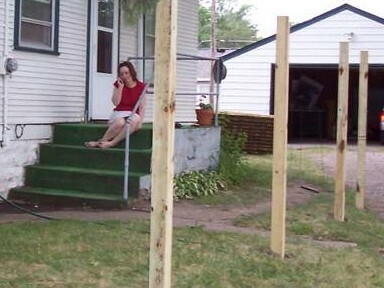 That was until we built a fence, when its utility decreased and we decided to replace it with wooden steps. The old steps were facing the wrong direction, especially after the fence was finished. Removing the handrail was surprisingly easy. Nuts unscrewed from bolts, and tubes slid out of tubes with minimal effort. With the handrail out of the way, it was time for the fun to begin. I don’t consider myself a violent person, but I’ve wielded a few sledge hammers in my time, and I do enjoy a nice bit of demolition. So, I was in a good frame of mind when I picked up my seven-pound sledge hammer that warm, bright Saturday afternoon. The corner to the left of the hammer and chisel was where I planned to begin the demolition. Yes, I even thought that a small hammer and chisel would be enough to take out these steps. I would start at one of the corners, a weak point. That would show me how the steps were built, and help me decide the best way to proceed. I prepared by placing the head of the hammer on the spot I wanted to hit, and getting my feet into position. Once ready, I took a big swing. The hammer came from high over my head onto the steps. The blow was perfect. The hammer head struck those steps with full force. The force of the strike should have created cracks in the concrete, breaking off a chunk. What actually happened took me by surprise. You know that thing about every action having an equal and opposite reaction. Well, never before was it so well demonstrated. Most of the force transmitted by the hammer to the steps was immediately given back to the hammer, which sailed back over my head, moving backwards along the same arc it followed on its way down. It was as if the film had been reversed. My surprise was such that the hammer almost flew from my grasp. The only energy not sent straight back into the hammer, went into the clear, bell-like tone that came from the concrete. In that fraction of a second, I knew that further attempts to demolish those steps with a sledge hammer would be futile. I did continue with the hammer that day, and some small pieces of concrete broke from around the edges. But to get the job done, I knew that we were gonna need a bigger hammer. 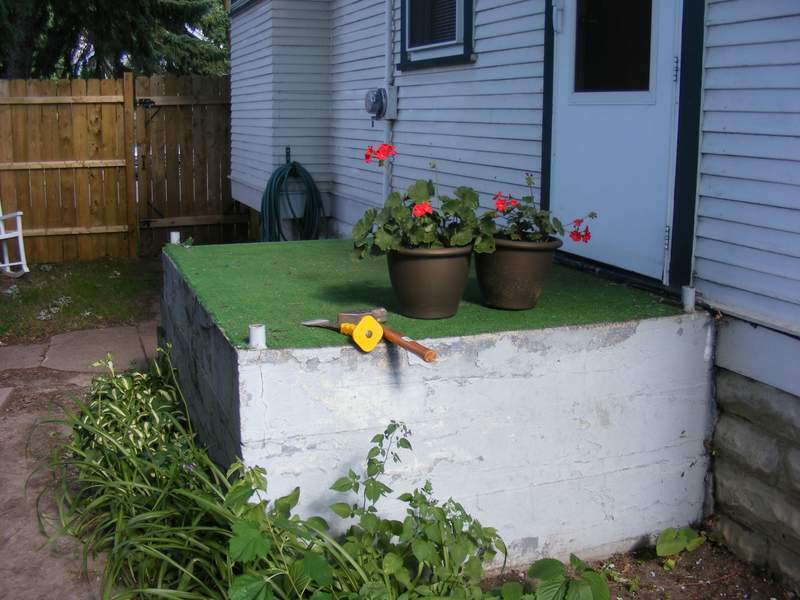 This entry was posted in Before & After, Construction, D'oh!, Outdoor Building Projects, Yard & Garden and tagged D'oh!, demolition, yard. Bookmark the permalink.